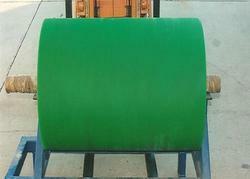 Leading Manufacturer of polyurethane rollers from Chennai. Our design team works with each customer to figure the load bearing capacity of every Polyurethane Elastomer roller, the necessary core design and the selection of the right compound with the best physical properties for the design or application. In addition to urethane roller, we can also refurbished used rollers utilizing the existing cores at a fraction of the cost of buying new ones. The metal part strongly bonded with PU.